The Safariland Model 74 Handgun and Rifle Combination Magazine Pouch is ideal for law enforcement officers carrying a carbine, or rifle, alongside their handgun. The pouch is designed to contain three magazines, two pistol and one rifle. An adjustable tension screw allows for a snug fit with a variety of magazines, improving overall retention capabilities. The pistol magazine pouches incorporate sturdy top flaps with snaps to secure items. It attaches to a 2.25-inch duty belt and includes both low-profile horizontal and vertical mounting holes for a personal choice of ride positions. The rugged SafariLaminate material guarantees lasting durability and comes with a scuff-resistant finish that maintains a professional look. I just started in my local Sheriff Department. A few guys on my squad run a double pistol mag holder that also has a cuff pocket sandwiched in bewteen the mags and the body. Is this the style of mag pouch that I am searching for to hold both mags and a cuff. 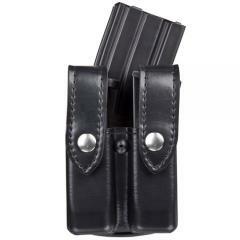 Check out the "Safariland Magazine and Cuff Pouch Top Flap Case - Model 72".